I remember as a child in the 1950s being sent to the grocer by my mother to buy a pack of the waxed paper cases used for making small cakes. This was always an exciting experience because it meant she was going to make a batch of fairy or butterfly cakes, which was what we all used to once call cupcakes in Britain and Ireland. The fairy cakes were little fluffy buns baked in the cases and then covered in icing with a few hundreds and thousands scattered over the top. The related butterfly cake was made by chopping off the top of the same cake and filling its centre with butter icing. The decapitated top was cut in two and stuck in the icing to make the butterfly's wings. Nearly every Sunday these cakes graced our high tea table. And with the large number of children in my family they tended to vanish very quickly. When I first encountered an American style muffin in an English cafe many decades later, I was confused. It looked just like a giant fairy cake to me. Surely a muffin was a round of yeasted bread dough baked on a girdle? Anything to me that was baked in a paper case had to be a fairy cake, even if it was larger than usual. It was the paper case that defined the cake. I remember so well scrapping off those sticky bits that stuck to the bottom of the case. That was the best part. British fairy cakes, American muffins and cupcakes. What these all have in common are the crimped paper cases in which they go into the oven. They are as essential to a cupcake as a cone is to an ice cream. In all the material I have read so far on the history of these cakes, these essential little pieces of culinary origami have been completely ignored. So when were cakes first baked in paper cases? Paper has been used for centuries for putting under and over cakes baked in wood fired ovens to stop the surface from burning. The wooden hoops, garths and metal moulds used for baking cakes were wrapped in layers of paper for the same reason, a practice still carried out today. But it was a big jump to bake cakes in containers made of paper. The earliest recorded instance of a paper case being used for baking a cake that I know, is described in a recipe to make Naples biscuit written by Frederick Nutt in The Complete Confectioner (London: 1789). Naples biscuit was what we would now call sponge cake and was made in a very similar way then as it is now. Nutt tells us 'to take one sheet of paper, and make the edges of it stand up about an inch and a half high, and pour your batter in it'. To get the cake out, you had to brush the paper with water on the back, then wait a few minutes for the water to soak in and the cake would come out perfectly. I have made Nutt's orange flower and caraway flavoured Naples biscuit many times and it really makes sense to bake it in this way. In his early career, Nutt worked as an apprentice at the Pot and Pineapple, a celebrated confectionery shop in Berkeley Square in London. In the following century, another member of staff at this establishment was a young Italian from Colorno near Parma who arrived to work at the shop just after the Napoleonic Wars. 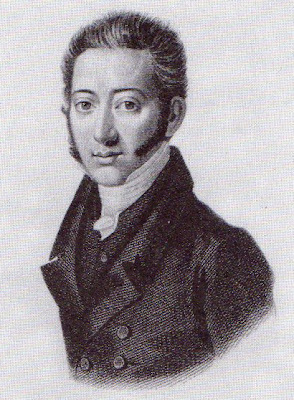 This was William Jarrin, who in 1820 issued the most important work on confectionery techniques to be published in Europe at the time, The Italian Confectioner. This work, sadly nowadays unknown in Italy, was written in English. It describes in great detail not only the techniques of the day used to make confectionery, but also the equipment. In a recipe for making Biscuits in Cases, Jarrin first of all tells us that the paper containers for making these 'are generally made of a square form', exactly like those described by Nutt forty years earlier. However, he then goes on to say that they are 'sometimes round like little baskets' and proceeds to explain how these were made, referring us to a diagram illustrating a finished case and the equipment required to make it. In describing the technique, he instructs us 'to form plaits like the frill of a shirt'. The plaited paper cupcake case was born! Jarrin's engraved plate is illustrated at the top of this posting. William Jarrin, the earliest author to describe cakes baked in crimped paper cases. If Amelia Simmons was the Mother Of All Cupcakes, William Jarrin must be the Father. 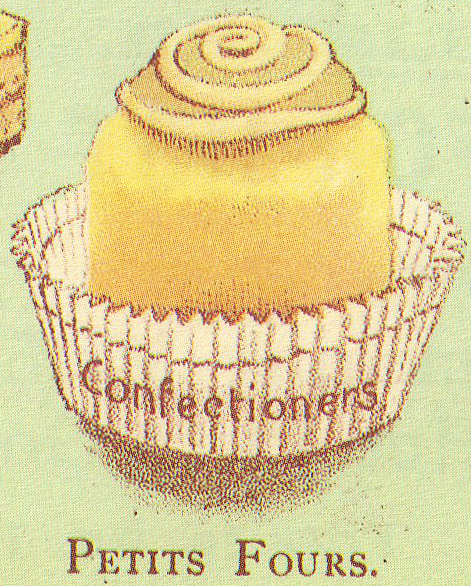 Jarrin describes these little cakes as biscuits, which might puzzle a modern American or English reader, because the word has different meanings nowadays. In the early nineteenth century 'biscuit' was a common name for sponge or savoy cake. So in many ways, Jarrin's little biscuits in cases deserve to be given a prominent place in the history of the cupcake, because they are much closer to our modern concept of the cake than any of the other historic cakes we have looked at so far. Later nineteenth century authors also describe Jarrin's exact method of making paper cases by hand, which came to be used for serving not only baked goods, but also soufflés, mousses and jellies. Even special ice creams called biscuits were served in them! By the middle of the nineteenth century these cases were being manufactured on a large scale by companies like Hunt, Mansell, Catty and Co. Many very fancy variations on the theme became fashionable in the 1890s. 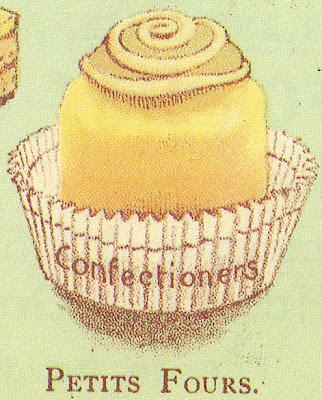 The modern craze for ornamenting American style cupcakes with frosting and decorative icing was pre-empted in the early twentieth century here in England by a fashion for French style petits fours served in Jarrin-style paper cases. These were in fact little miniature cakes made of carefully cut pieces of Genoese ornamented with fondant and other forms of icing and served, though not baked, in little crimped cases. Here is an illustration of one from 1903. In the amazing world of food history studies, you quickly learn that there is nothing new. It has all been done before! And frequently done much better. At the beginning of part 1 of this rant, I hinted that the soundbite style approach to food history preferred by television producers can frequently give a very distorted version of the truth. I would like to add that this is not usually the fault of the experts who are often asked to contribute. They have no control over how their interview or demonstration will be edited. And of course this is not the end of the story. Both Plumcake and I would love to hear from any readers of this blog who have any additional information about the development of these interesting cakes. This blog is created by Historic Food. Go to the Historic Food Website. Do you really think that Amelia Simmons was the mother of cupcakes? I am looking into this detail because it seemed like perhaps the cupcakes are descended from the small queen cakes although I can't find sources. Could you point me to sources that might help me to work out this detail.. it is important to my current research project. It depends what you define as a cup cake. Amelia Simmon's gives the earliest printed recipe (1796) for a cake that is cooked in a cup. But a cup cake could also be a cake whose ingredients were measured out in cups. It looks like you should read the other two postings Queen Cakes and Cupcakes 1 and 2 on this blog. We cite all the important sources relating to cakes called cupcakes and have a lot to say about Queen Cakes too. I'm studying the broadest sense of anything that could have influenced decisions to create cupcakes..I've even looked at articles talking about animal-shaped biscuits in tribal Germany. And I did look at your other pages which were also very informative, I'm going to be looking at some of those, certainly. What would you say are the typical dimensions of one of those Queen Cake pans? My reason for this is because I'm trying to write an article about the absolutely out of control cupcake craze in the states (don't know its status in the rest of the world).. I have made it as far back as Amelia Simmons and her little cakes but wondered if there was an earlier influence she would have been taking from. It's been such fascinating research, all in all.. anyway, I'm glad for your page! Did I say article? I mean research paper.. this is academic research. 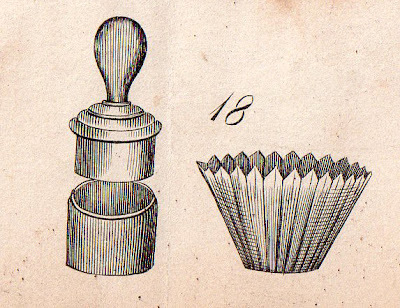 The American cupcake so popular today is only related by name to Amelia Simmon's little cakes, which are actually very unusual because they were yeast leavened. The kind of small 'biscuits' or sponge cakes baked in paper cases, of which the example described by Jarrin in this post are the true ancestors of the modern cupcake. So far, nobody else has taken any notice of the fact that to make a modern cupcake, you use a paper case. Now Jarrin was born in Italy, trained in Paris and spent most of his working life in London. If he was the first to make cakes in paper cases like this, it could push the origin of the cake away from the US. Perhaps it originated in Italy, France or even the UK. I have about twenty nineteenth century queen cake moulds. They are in a variety of shape and are never more than two and a half inches in the largest dimension. They are about three quarters of an inch deep. As we mention in one of the postings Queen Cakes go back to the early eighteenth century and possibly earlier. I am afraid I dislike the modern cupcake intensely. I think it is a gastronomic abomination - culinary kitsch of the most garish kind. And also so sugary it is unhealthy and unpleasant to eat. Agreed. The whole reason I got onto studying cupcakes is because of a class called "Interpreting Kitsch Camp and Bling Aesthetics"..I thought of kitsch and though of cupcakes and cake pops and something clicked. I don't think they are even treated like food these days. I think they are treated like fashion and American culture has this thing about edible this and edible that..I can't prove any of this, of course, but it's what I'm thinking. I've started to believe that the craze is largely fueled by blog culture (the kind that's a tad less intelligent than yours) and our ability to post pictures of these sometimes ridiculous treats that are too decorated to even eat. For myself, I prefer simpler smaller ones that are easy to consume..the homemade kind. Again, so glad for you site! Thank you.. perhaps one day I'll get lucky and be able to take one of your cooking courses.